Website editor’s note: 1080 (Sodium Fluoroacetate) is a poison that is incorporated into pellets and may be legally spread via aerial drops around many areas of New Zealand to kill introduced animals such as possums which are considered to be pests.Unfortunately, 1080 is an indiscriminate poison which often kills non target creatures including endangered native birds, dogs and farm animals. Video footage of dying animals also shows that ingestion of this poison results in a prolonged and very cruel death. Recently, members of a New Zealand family were hospitalised with life-threatening symptoms after eating wild pork that was probably contaminated with this poison. A nationwide lhikoi ( peaceful march) again the ongoing use of aerial drops of 1080 has been organised and the text below has been excerpted from the organisers’ website. There are three significant government agencies that aerially spread 1080 poison bait across land and water in New Zealand – The Department of Conservation, TB Free & OSPRI, and regional councils. ​Up until 2017, regional councils issued resource consent certificates to government agencies and contractors that permitted 1080 poison bait to be spread across land and directly into water. However, in 2017, the New Zealand Government changed legislation, and that legislation now permits poison bait to be aerially spread across land and directly into water, without the requirement for a resource consent certificate – effectively excluding the aerial distribution of poison bait, from the protection of the Resource Management Act. ​The New Zealand Government owns Orillion, the 1080 poison factory that imports and manufactures 1080 poison, and brodifacoum cereal baits. The factory’s mission statement makes it clear that the company exists for profit. Through its new rules the New Zealand Government has effectively excluded the spreading of Compound 1080 – a WHO class A1 eco-toxin – from environmental protection legislation, to increase its company profits. ​To achieve greater profits, if a government changes legislation for an activity equivalent to an act of terrorism (dropping an eco-toxin with no antidote directly into water supplies and forests which are sources of wild foods) – does that relaxed law make that activity no longer equal to an act of terrorism? 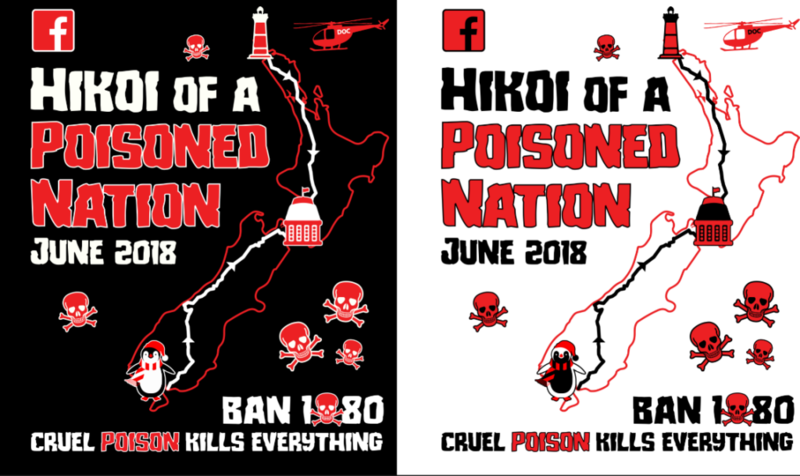 Alan Gurden and Emille Leaf, co-founders of Hikoi of a Poisoned Nation, believe that the New Zealand Government, and its poisoning agencies are indeed committing an act of terror by aerially spreading 1080 poison bait across New Zealand forests and waterways. So the team are calling for all New Zealanders to join their peaceful hikoi. The pair will walk from each end of the country, starting with Alan at Bluff in the south, and Emille at Cape Reinga in the north, converging in Wellington. Alan will begin his march on the 15th of June, and Em and Emille will begin his march on the 14th of June, 2018. The pair, with their supporters, will converge at Parliament, in Wellington, where the Prime Minister Jacinda Ardern has agreed to meet them. The men believe thousands of people will join the march by the time they reach Parliament. ​Videos and information about the hikoi will be loaded to this page. The official Hikoi of a Poisoned Nation Facebook Page can be visited by clicking this link.